A committee for drafting the ethnic media policy has been established for the sustainability of ethnic media during the Sixth Ethnic Media Conference. 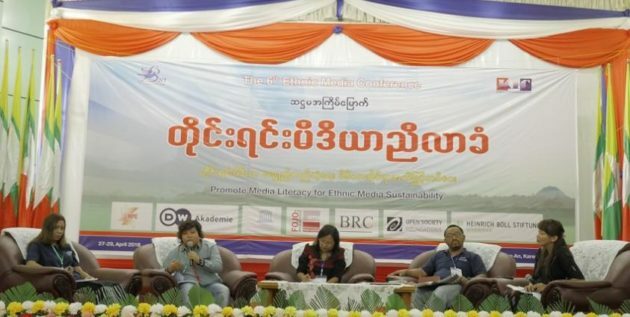 Narinjara News’s chief editor U Khaing Mrat Kyaw told Karen News that the decision was made during the Sixth Ethnic Media Conference, which was held at Zwekabin Hall in Hpa-an, Karen State on April 27-29 under the theme of “Promoting Media Literacy for Ethnic Media Sustainability”. “Generally, ethnic media doesn’t have a market. They don’t get advertisements so there are many difficulties in their sustainability. It’s impossible to survive if they don’t get aids from the government. The government needs to draft actual policies for ethnic media development and carry them out accordingly. That’s why we are trying to draft the ethnic media policy,” he said. U Khaing Mrat Kyaw added that he hope the committee and policies will emerge soon since information has been collected during the conference for the emergence of the policy and organized drafting of the policy. A nine-member committee has been established with media persons from state-based ethnic media outlets, who are members of the BNI, and experts. In addition, the committee members will cooperate and implement the future plans. The ethnic media policy, which is desired by ethnic media, will cover issues on policy provision, policy management and implementation, recognition of ethnic media, freedom of information, mother-tongue literature/language-based media, safety of ethnic media reporters/female reporters, media ethics, and sustainability of ethnic media. “The already weakened women’s sectors, safety, dos and don’ts, and rights will become more involved if the ethnic media policy can be drafted. The number of female reporters may increase so women’s voices can be covered more [in the media],” said Seng Mai, chief editor of Myitkyina Journal. The three-day conference discussed sustainability of ethnic media, increasing the number of qualified female reporters in ethnic media, development of the right to teach ethnic literature, the right to obtain information from government departments on the same level, and uplifting the safety and protection of reporters. Besides the emergence of the ethnic media policy, the conference also set down decisions to establish an ethnic media training school and increase the production of accurate and comprehensive news to raise public awareness on the local armed conflict and the peace process. Four demands have been made by the conference including the demands to the government and international organizations to continue their assistance in uplifting media awareness in ethnic areas and increasing the number of qualified ethnic reporters and immediately release detained reporters. Since 2013, the ethnic media conference has been held annually in Mawlamyine, Taunggyi, Hakha, Mrauk U, and Loikaw. The sixth conference was held in Hpa-an, Karen State and the seventh conference will be held in the Kachin State.